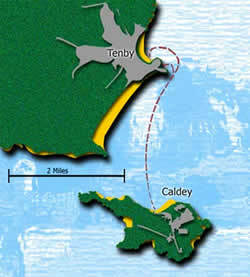 Tenby to Caldey is about a two and a half mile swim, with the right tidal conditions. However, it is not a straightforward straight line swim. It requires local tidal expertise to work out which direction to swim in, when to start, when not to attempt it and, perhaps most importantly, when to give up. Safety for swimmers is paramount in our event organisation. Is the swim due to take place in 2018? Yes, Pete, likely to be in July or August. We’ll have a better idea early in the new year, but entries won’t be available until April. Hi. I know it’s only 2nd of Jan, but we’re looking at booking our trip to tenby and hoping to time it with the swim. Any news on dates yet? The 2018 Caldey Swim will be on 12th August, starting from Caldey Island at 12.45. Entries will be available from 9am on 1st March – a St Davids’s Day present! Keep following us for further developments. Entries will be available from 9am on 1st March – a St Davids’s Day present – so earlier than in previous years.